In a murine model, interleukin (IL)-17 plays a critical role in the pathogenesis of arthritis. There are controversies, however, regarding whether IL-17 is a proinflammatory mediator in rheumatoid arthritis (RA). We previously established an ex vivo cellular model using synovial tissue (ST)-derived inflammatory cells, which reproduced pannus-like tissue growth and osteoclastic activity in vitro. Using this model, we investigated the effects of IL-17 on pannus growth and osteoclastogenesis in RA. Inflammatory cells that infiltrated synovial tissue from patients with RA were collected without enzyme digestion and designated as ST-derived inflammatory cells. 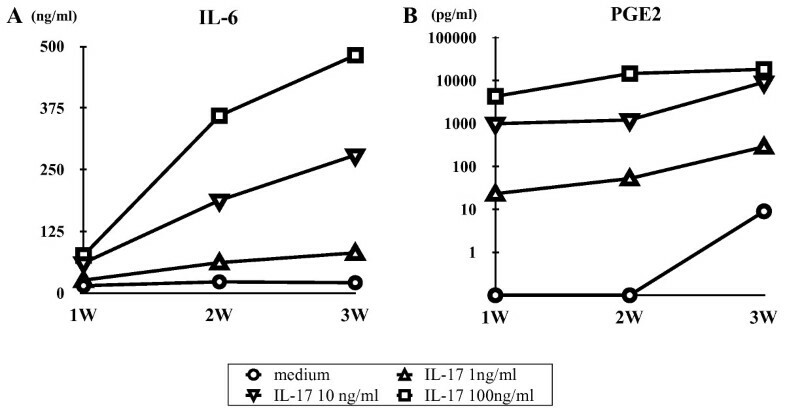 ST-derived inflammatory cells were cultured in the presence or absence of IL-17 or indomethacin, and the morphologic changes were observed for 4 weeks. Cytokines produced in the culture supernatants were measured by using enzyme-linked immunosorbent assay kits. Osteoclastic activity was assessed by the development of resorption pits in calcium phosphate-coated slides. Exogenous addition of IL-17 dramatically enhanced the spontaneous production of IL-6 and prostaglandin E2 (PGE2) by the ST-derived inflammatory cells, while it had no effect on the production of tumor necrosis factor (TNF)-α and macrophage colony-stimulating factor (M-CSF). Furthermore, IL-17 did not affect the spontaneous development of pannus-like tissue growth and osteoclastic activity by the ST-derived inflammatory cells. On the other hand, IL-17 enhanced pannus-like tissue growth, the production of TNF-α and M-CSF and the development of osteoclastic activity in the presence of indomethacin, an inhibitor of endogenous prostanoid production, while exogenous addition of PGE1 suppressed their activities. The present study suggests that IL-17 induces negative feedback regulation through the induction of PGE2, while it stimulates proinflammatory pathways such as inflammatory cytokine production, pannus growth and osteoclastogenesis in RA. Rheumatoid arthritis (RA) is chronic autoimmune inflammatory disease that ultimately leads to the progressive destruction of cartilage and bone in numerous joints. Proinflammatory cytokines such as tumor necrosis factor (TNF)-α , interleukin (IL)-1  and IL-6  were produced from synovial tissue (ST), which maintains its inflammatory condition. Inflammation of synovial membrane results in the development of aggressive granulation tissue, called pannus. Pannus tissue is composed mainly of inflammatory cells such as macrophages and fibroblast-like synoviocytes (FLSs) . At present, TNF-α and IL-6 are among the most important targets of therapy, and blocking TNF-α results in a rapid and sustained improvement of clinical signs and symptoms [5–7]. Anti-TNF therapy also prevents radiological progression of joint destruction [8–10]. Anti-IL-6 receptor monoclonal antibody (mAb) (tocilizumab) has also proved to reduce disease activity, even in patients who had an insufficient response to anti-TNF therapy, and to inhibit the progression of structural joint damage [11–13]. These clinical experiences suggest that there are at least two pathways, TNF-α-dependent and IL-6-dependent, leading to the progression of pannus growth and joint destruction in RA. Recent studies have demonstrated critical roles of IL-17, which is produced by a newly identified subset of CD4+ T cells, Th-17, in animal models of arthritis [14, 15]. In humans, IL-17 is a potent inducer of other proinflammatory cytokines, such as TNF-α, IL-1β, IL-6 and IL-8 from monocytes and/or macrophages or synovial fibroblasts [16, 17]. IL-17 has been detected in synovial fluids of RA [18, 19]. These findings suggest that IL-17 is an important cytokine located upstream of the two pathways, TNF-α-dependent and IL-6-dependent. Preliminary clinical trial using humanized anti-IL-17 mAb has shown an improvement of clinical signs and symptoms of RA . It is still unknown, however, whether inhibition of IL-17 prevents joint destruction in RA. To further confirm the hypothesis, the present study was undertaken to clarify a role of IL-17 in RA using our recently established ex vivo human cellular model, where rheumatoid ST-derived inflammatory cells spontaneously develop pannus-like tissue in vitro and osteoclastic bone resorption . IL-17 was purchased from PeproTech (Rocky Hill, NJ, USA). PGE1 was purchased from Sigma-Aldrich (St. Louis, MO, USA). Indomethacin was obtained from Wako (Osaka, Japan). ST specimens were obtained from patients who fulfilled the American College of Rheumatology criteria for RA who underwent knee joint replacement. In compliance with institutional policies, informed consent was obtained from all patients. The study was approved by the ethics committee of each institution. ST-derived inflammatory cells were prepared as previously described . In brief, ST specimens were cut into small pieces and cultured in 100-mm dishes containing RPMI-1640 (Asahi Technoglass, Chiba, Japan) with 10% fetal calf serum (FCS) and 1,000 U/ml penicillin G sodium-streptomycin sulfate (Gibco BRL, Grand Island, NY, USA). After 1 to 3 days' incubation, tissue was removed and single cells were collected by vigorous pipetting. Cell suspensions were washed once, and viable cells were collected into Lymphocyte Separation Medium (Nacalai Tesque, Kyoto, Japan). Single suspensions of ST-derived inflammatory cells were seeded at a density of 5 × 105/well in 48-well culture plates and cultured in Dulbecco's modified Eagle's medium (DMEM; Gibco BRL) containing 10% FCS, 100 U/ml penicillin G sodium and 100 μg/ml streptomycin sulfate. The culture was observed for morphologic changes under an inverted phase-contrast microscope twice a week for 4 weeks. When cultured in DMEM and 10% FCS in the absence or presence of IL-17 (0.1 to 100 ng/ml) or indomethacin (100 nM to 1 μM), ST-derived inflammatory cells started to aggregate, forming foci within a few days. Further culturing resulted in three-dimensional (3-D) growth, which ultimately produced macroscopic tissue 2 mm in size within 4 weeks. Morphologic changes were semiquantitatively scored on a scale of 0 to 4, according to the degree of tissue development, where 0 was no cellular foci or aggregations, 1 was the formation of cellular foci or aggregation, 2 was further growth of cellular aggregations, 3 was further 3-D growth with a multilayered structure, and 4 was the development of macroscopic tissue. Cumulative tissue growth score was calculated by the total sum of the tissue growth scores obtained twice weekly for 4 weeks of culture. Half of the supernatants were collected twice weekly and replaced with fresh medium or the addition of a half dose of IL-17 or indomethacin. Supernatants were frozen at -80°C until assayed. ST-derived inflammatory cells were seeded in 48-well culture plates (5 × 105/well) and cultured in DMEM and 10% FCS. Half of the supernatants were collected three times per week and replaced with fresh medium. Supernatants were frozen at -80°C until assayed, and levels of IL-6, PGE2, TNF-α and M-CSF (all from R&D Systems, Minneapolis, MN, USA) released into the culture supernatants were measured using enzyme-linked immunosorbent assay kits according to the manufacturers' recommendations. ST-derived inflammatory cells were seeded (1 × 105 cells/well) onto calcium phosphate-coated slides (Osteologic; BD Biosciences, MA, USA) and incubated in RPMI-1640 with 1% FCS, 50 μg/ml ascorbic acid (Sigma) and 10 mM β-glycerophosphate (Sigma) for 7 to 14 days in a CO2 incubator (5% CO2, 100% humidity at 37°C). Half of the supernatants were replaced with fresh medium once weekly. The calcium phosphate-coated slides were washed with distilled water and bleach solution (6% NaOCl and 5.2% NaCl) and then air-dried. The number of resorption pits were counted under a microscope. Using a recently established ex vivo cellular model of RA, we examined the effect of IL-17 on the production of IL-6 and PGE2 by the ST-derived inflammatory cells. During the cell culture, ST-derived inflammatory cells spontaneously produced IL-6 and PGE2 in the supernatant as shown in Figure 1. Addition of IL-17 into the culture resulted in the enhancement of both IL-6 and PGE2 production in a dose-dependent manner. Effect of interleukin (IL)-17 on the production of (A) IL-6 (A) and (B) prostaglandin E 2 (PGE 2 ) by the synovial tissue (ST)-derived inflammatory cells. Cells were incubated in the absence or presence of increasing concentrations of IL-17 (0 to 100 ng/ml) for 3 weeks. IL-6 (n = 7) and PGE2 (n = 3) in the culture supernatants were measured by enzyme-linked immunosorbent assay as described in Materials and methods. We have reported that ST-derived inflammatory cells showed spontaneous development of pannus-like tissue in vitro . The ST-derived inflammatory cells at the beginning of the culture contained 1.6% to 4.2% FLSs (mean, 2.6%), 35.8% to 65.7% macrophages (mean, 53.7%) and 32.4% to 62.6% small lymphocytes (mean, 44.7%) when assessed by morphological observation. During the culture of ST-derived inflammatory cells, marked proliferation and migration of the FLSs into the pannus-like tissue were observed. At the end of culture, pannus-like tissue contained more than 80% FLSs and less than 10% of macrophages and T cells as assessed by immunohistochemistry. As IL-17 enhanced IL-6 and PGE2 production by the ST-derived inflammatory cells, we investigated the effect of IL-17 on the development of pannus-like tissue in vitro. 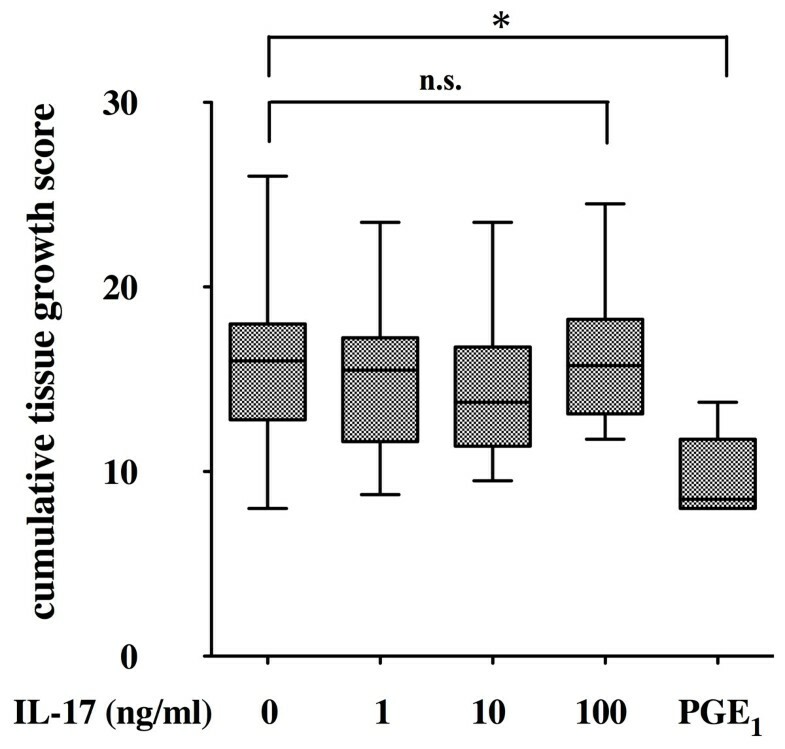 The cumulative tissue growth score during 4 weeks of culturing of ST-derived inflammatory cells was not affected by the addition of IL-17 up to 100 ng/ml, while it was suppressed by the exogenous addition of 100 nM PGE1 (Figure 2) as well as 100 nM PGE2 (data not shown). Effect of interleukin (IL)-17 and prostaglandin E 1 (PGE 1 ) on pannus-like tissue growth in vitro. Synovial tissue (ST)-derived inflammatory cells were incubated in the absence or presence of increasing concentrations of IL-17 (0 to 100 ng/ml) (n = 17) or PGE1 (100 nM) (n = 9). Morphologic changes were observed under an inverted phase contrast microscope twice weekly for 4 weeks and were scored semiquantitatively on a scale of 0 to 4 according to the degree of tissue development as described in Materials and methods. Box and whisker plots indicate 25th/75th percentile and minimum/maximum, respectively. Bar indicates the median value. *P < 0.001 (by Mann-Whitney U test). These results suggested that the effect of IL-17 on the development of pannus-like tissue was modified by IL-17-enhanced endogenous PGE2 production. To confirm this possibility, we investigated the effect of indomethacin, an inhibitor of endogenous prostanoids, on the pannus-like tissue growth in vitro. Addition of indomethacin resulted in a significant enhancement of the in vitro tissue growth by the ST-derived inflammatory cells (Figure 3). In the presence of indomethacin, the in vitro tissue growth was enhanced by the addition of IL-17 in a dose-dependent manner. 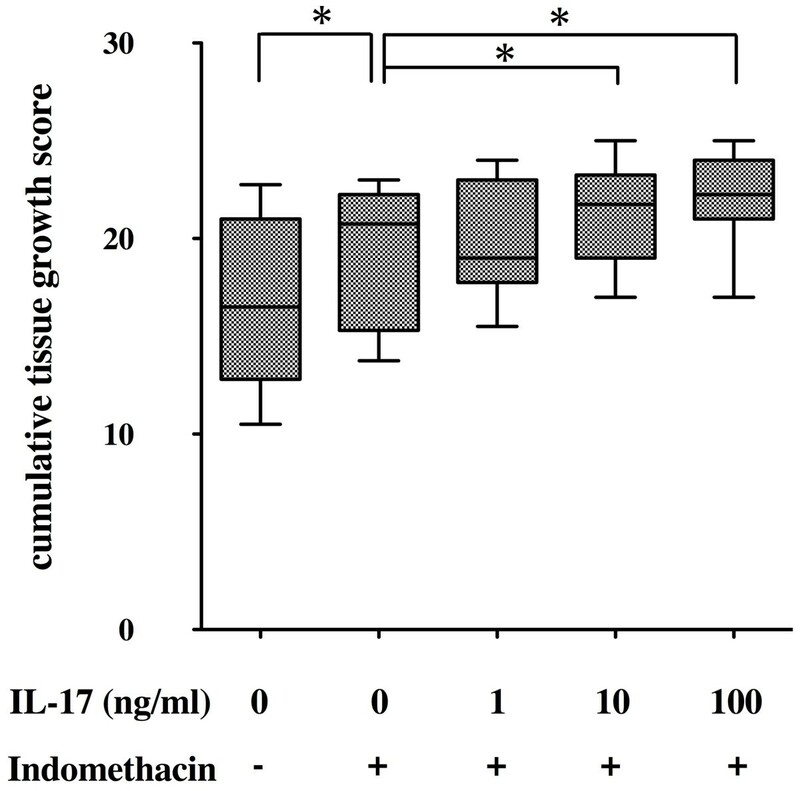 Effect of interleukin (IL)-17 on pannus-like tissue growth in the presence of indomethacin. Synovial tissue (ST)-derived inflammatory cells (n = 7) were incubated with an incremental dose of IL-17 in the absence or presence of indomethacin (100 to 1000 nM). Morphologic changes were observed under an inverted phase contrast microscope twice weekly for 4 weeks and were scored semiquantitatively on a scale of 0 to 4 according to the degree of tissue development as described in Materials and methods. Box and whisker plots indicate 25th/75th percentile and minimum/maximum, respectively. Bar indicates the median value. *P < 0.05 (by Wilcoxon signed-rank test). Rheumatoid ST contains a number of proinflammatory cytokines that influence osteoclast formation and bone resorption. Proinflammatory cytokines such as TNF-α and IL-6 stimulate differentiation and activation of osteoclasts, resulting in increased bone resorption. M-CSF is constitutively produced by synovial fibroblasts from RA patients and contributes to the differentiation of synovial macrophages into osteoclasts. We investigated the effect of IL-17 on M-CSF and TNF-α production from ST-derived inflammatory cells. During the cell culture, ST-derived inflammatory cells spontaneously produced M-CSF and TNF-α in the supernatant as described previously . Contrary to our expectation, spontaneous production of both M-CSF and TNF-α was not affected by the addition of IL-17 up to100 ng/ml (Figures 4A and 4B). Effect of interleukin (IL)-17 on the production of macrophage colony-stimulating factor (M-CSF), tumor necrosis factor α (TNF-α) and IL-6. Synovial tissue (ST)-derived inflammatory cells were incubated with incremental doses of IL-17 in the absence or presence of indomethacin (100 to 1,000 nM) for 1 week. Enzyme-linked immunosorbent assay kits were used to measure the concentration of (A) TNF-α, (B) M-CSF and IL-6 (C) in the culture supernatants derived from seven donors. There were no significant differences in the production of IL-6 between the presence and absence of indomethacin. Box and whisker plots indicate 25th/75th percentile and minimum/maximum, respectively. Bar indicates the median value. *P < 0.05 (by Wilcoxon signed-rank test). As PGE2 is known to inhibit the production of M-CSF and TNF-α from macrophages and synovial fibroblasts [22, 23], respectively, we examined the effect of IL-17 on the production of M-CSF and TNF-α in the presence of indomethacin to block the effect of endogenous PGE2. In the presence of indomethacin, IL-17 significantly enhanced the production of M-CSF and TNF-α in a dose-dependent manner (Figures 4A and 4B), while IL-17-induced IL-6 production was not affected by the addition of indomethacin (Figure 4C). We previously showed that ST-derived inflammatory cells in a 1% FCS-containing medium showed spontaneous development of multinucleated giant cells within 2 weeks. They were tartrate-resistant acid phosphatase-positive multinucleated cells and developed numerous resorption pits when incubated on a calcium phosphate-coated slide . Exogenous addition of IL-17 tended to increase the number of resorption pits, but the difference did not reach statistical significance (Figure 5). Indomethacin significantly enhanced the development of resorption pits by the ST-derived inflammatory cells. 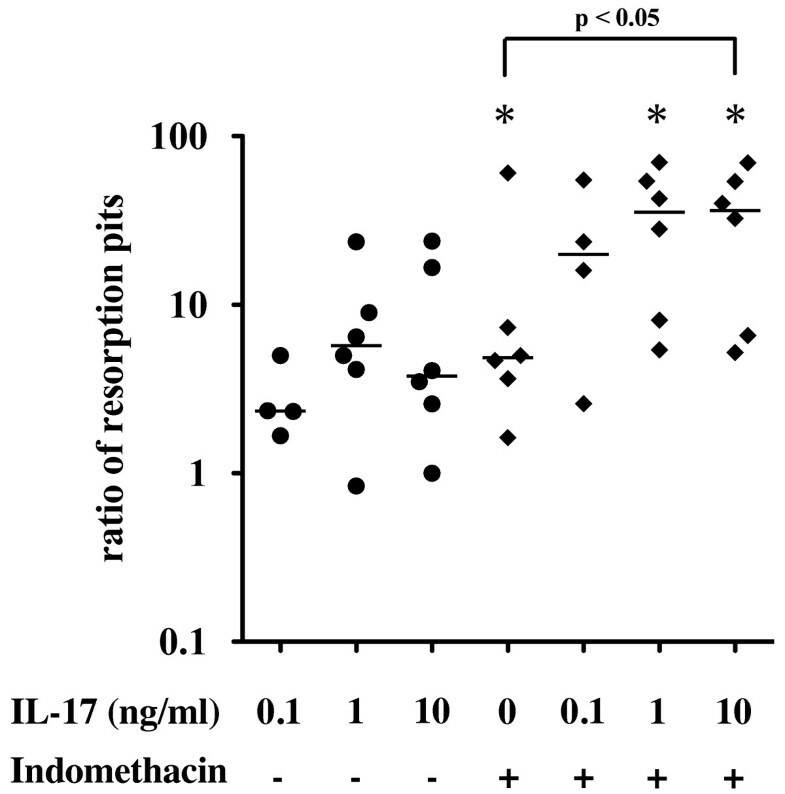 In the presence of indomethacin, IL-17 significantly increased the number of resorption pits in a dose-dependent manner (Figure 5). Effect of interleukin (IL)-17 on the osteoclastogenesis. Osteoclastic activity was assessed by the development of resorption pits in calcium phosphate-coated slides as described in Materials and methods. Synovial tissue (ST)-derived inflammatory cells (n = 6) were cultured with incremental doses of IL-17 in the absence or presence of indomethacin on calcium phosphate-coated slides for 2 weeks and examined for the development of resorption pits. The ratio to the number of resorption pits in medium alone was plotted. Bar indicates the median value. *P < 0.05 vs. medium alone (by Wilcoxon signed-rank test). Inflammation in general is fundamentally a protective response against cellular and tissue injury caused by diverse pathological stimuli, and it is closely intertwined with the process of repair. In some circumstances, inflammation and tissue repair are not successfully completed and inflammation perpetuates chronically. RA is characterized by chronic inflammation of the synovial membrane, which results in the development of aggressive granulation tissue, so-called pannus, and the subsequent destruction of cartilage and bone. Pannus tissue is composed mainly of invasive phenotype of FLSs, lymphocytes and activated macrophages, and in the case of bone erosion, monocyte-derived osteoclasts . Cytokine networks and cell-cell interaction, as well as other inflammatory mediators, such as prostanoids, contribute to the development of pannus tissue and osteoclastic activity. This complex system of rheumatoid synovitis includes both positive and negative feedback regulation of inflammatory responses. Therefore, a human cell model that represents this complex system will be useful to study the role of IL-17 in the pathogenesis of RA. We previously established an ex vivo cellular model using the ST-derived inflammatory cells, which reproduced pannus-like tissue growth and osteoclastic activity in vitro. Using this model, the present study demonstrated that IL-17 enhanced production of proinflammatory cytokines, pannus-like tissue growth and osteoclastic activity by the ST-derived inflammatory cells, while IL-17 simultaneously induced negative feedback regulation through the enhanced production of PGE2, a potent deactivator of macrophages and other inflammatory modulator . Inhibition of endogenous PGE2 production resulted in the enhancement of pannus growth and osteoclastic activity. Therefore, the net effects of IL-17 may depend upon the balance between the positive and negative regulatory responses. IL-17 is an important proinflammatory cytokine involved in the pathogenesis of RA. Previous studies have shown that IL-17 is present in rheumatoid synovial fluid and can upregulate several mediators of inflammation, such as TNF-α, IL-1, IL-6, IL-8 and matrix metalloproteinases (MMPs), in FLS. Among other cytokines, both TNF-α and IL-6 have been shown to play a pivotal role in the progression of RA. The importance of TNF-α and IL-6 in the pathogenesis of RA has been established by the clinical experiences with anti-TNF and anti-IL-6 therapy [5–7, 11, 13]. Blocking TNF-α by either neutralizing mAbs (infliximab and adalimumab) or soluble TNF receptor-immunoglobulin G (IgG)-Fc fusion protein (etanercept) resulted in a rapid and sustained improvement of clinical signs and symptoms in both early and advanced RA. Anti-TNF therapy also prevented radiological progression of joint destruction [8–10]. Anti-IL-6 receptor mAb (tocilizumab) has also been proved to reduce disease activity, even in patients who had insufficient response to anti-TNF therapy , and to inhibit the progression of structural joint damage [11, 13]. These clinical experiences suggest that there are at least two pathways, TNF-α-dependent and IL-6-dependent, leading to the progression of pannus growth and joint destruction in RA. IL-17 has been shown to stimulate TNF-α and IL-6 expression [16, 17], suggesting that IL-17 is an important cytokine located upstream of the two pathways. PGE2 has been established as a regulator of cytokine production by activated macrophages. PGE2 inhibits the production of TNF-α, IL-6, IL-8 and IL-12 and downregulates the expression of IL-12 receptor on macrophages [23, 25, 26]. PGE2 downregulates TNF-α and upregulates IL-10 through the EP2 and EP4 receptors. This effect of PGE2 can reverse cytokine disequilibrium from proinflammatory toward anti-inflammatory [24, 27]. PGE2 has been reported to suppress IL-17-induced TNF-α mRNA expression and protein synthesis in human macrophages and synovial fibroblasts from RA patients via EP4 receptor- and EGR-1-mediated inhibition of c-Jun expression . PGE2 induces egr-1 mRNA expression and protein synthesis by activating transcription factor 2 (ATF-2) dimer via transactivation of the egr-1 promoter. IL-17-upregulated promoter activity was largely dependent on ATF-2/c-Jun transactivation. PGE2 suppression of IL-17-induced ATF-2/c-Jun transactivation, and DNA binding was dependent on egr-1-mediated inhibition of the induced c-Jun expression. While upregulating TNF-α expression, IL-17 also induces cyclooxygenase 2 (COX2)/PGE2 expression, which in turn downregulates TNF-α expression. This negative feedback regulation of TNF-α expression by PGE2 may be critical in the modulation of the immune and inflammatory responses in RA. The present study has demonstrated that IL-17-induced TNF-α production, pannus-like tissue growth and osteoclastic activity by the ST-derived inflammatory cells were effectively downregulated by the negative feedback loop through PGE2 production, while IL-17-induced IL-6 production was not. PGE2 has been shown to inhibit IL-6 production by activated human macrophages , while other studies have shown that PGE2 enhanced IL-6 production by IL-1β-stimulated human synovial fibroblasts and osteoblasts, as well as chondrocytes [22, 29, 30]. The present study has shown that the net effect of IL-17 on IL-6 production by the ST-derived inflammatory cells was not affected by the endogenous PGE2. This result suggests that the effect of IL-17 is mainly mediated by the IL-6 pathway, while the TNF-α pathway is downregulated by endogenous PGE2. In RA, increased FLS proliferation and/or decreased FLS apoptosis contributes to synovial hyperplasia and pannus growth . IL-17 has been shown to induce proliferation of FLS through the induction of Cyr61, a product of a growth factor-inducible immediate early gene, and the subsequent expression of Bcl-2 that prevents RA FLS apoptosis . COX2-derived PGE2 inhibits IL-1/TNF-α-stimulated MMP-1 release from FLSs via inhibition of extracellular signal-regulated kinase (ERK) . On the contrary, COX inhibitors attenuated PGE2 inhibition of ERK and enhanced the release of MMP-1 by FLSs . IL-1β and TNF-α stimulate the translocation of p65 and p50 from the cytosol to the nucleus and activate NF-κB in human RA synovial fibroblasts . PGE2 inhibits p65 translocation via inhibition of ERK activation and also enhances the expression of IκBα in an ERK-independent manner, suggesting that PGE2 inhibits NF-κB activation by both ERK-dependent and ERK-independent mechanisms. These data indicate that PGE2 may act to attenuate cytokine-induced inflammatory responses in RA synovial fibroblasts by regulating the localization of specific NF-κB family dimers . In summary, there is accumulating evidence that suggests a molecular cross-talk mechanism involving COX2 and PGE2 expression in the resolution of inflammation. Proinflammatory cytokines, including IL-17 and TNF-α, play a critical role in the progression of synovitis and joint destruction, mainly through activation of NF-κB, while they directly induce COX2 and PGE2 expression. PGE2 upregulates COX2 expression via EP2 and EP4 receptors and cyclic adenosine monophosphate-dependent signaling pathway, which in turn modulates the production of the proinflammatory molecules. The link between proinflammaory molecules and PGE2 could have considerable importance in the regulation of inflammatory cell activation of RA. The paracrine and autocrine feedback mechanisms via COX2, PGE2, EP2 and EP4 could help to avoid the potential pathological damage caused by the excessive production of inflammatory mediators in response to various biological stimuli in RA. In the present study, we used PGE1 instead of PGE2 as the exogenous source of cell cultures (Figure 2). Previous studies indicated that PGE1 and PGE2 are equivalent in terms of biological effects on human synovial fibroblast proliferation  and their binding affinity to PGE2-specific receptors EP1, EP2, EP3 and EP4 . Our preliminary data also shows that both PGE1 and PGE2 equivalently inhibited both FLS proliferation and in vitro pannus-like tissue growth by the ST-derived inflammatory cells in a dose-dependent manner (data not shown). The reason why we have used PGE1 instead of PGE2 was the fact that we were intending to develop a novel therapeutic strategy utilizing anti-inflammatory effects of PGE1. There have been several attempts to use PGE1 to treat autoimmune and inflammatory diseases such as adjuvant arthritis  and lupus nephritis . We also published the inhibitory effect of lipid microsphere-incorporated PGE1 in a collagen-induced arthritis model . Osteoclastic bone resorption is another important feature of pannus tissue in RA. Receptor activator of NF-κB ligand (RANKL) and M-CSF are essential for osteoclastogenesis [39, 40]. The expression of RANKL on activated T cells, osteoblasts and synovial fibroblasts contribute to osteoclastic bone resorption in RA patients. M-CSF is constitutively produced by synovial fibroblasts from RA patients and contributes to the differentiation of synovial macrophages into osteoclasts in collaboration with RANKL . In humans, IL-17 induced the expression of both RANK on osteoclast precursors  and RANKL on synovial fibroblast . A recent study showed that TNF-induced RANKL expression was IL-6-dependent . On the other hand, both TNF-α and IL-6 also stimulate osteoclastogenesis in a RANKL-independent manner [45, 46]. In the present study, we have demonstrated that IL-17 also stimulated M-CSF production by the ST-derived inflammatory cells. The result is consistent with a recent report that IL-17 induced M-CSF expression on human bone marrow-derived mesenchymal stem cells . Another important question is whether IL-17-enhanced osteoclastogenesis under the suppression of endogenous prostanoids is TNF-dependent and/or IL-6-dependent. IL-17 is known to stimulate RANKL expression on fibroblast-like synoviocytes through the induction of IL-6 . On the other hand, IL-17 is reported to induce osteoclast formation through RANK expression on osteoclast precursors . Whether this effect is TNF-dependent and/or IL-6-dependent remains unknown. These questions require further studies including experiments neutralizing TNF-α and IL-6. Proinflammatory cytokines such as TNF-α and IL-6 have been known to stimulate osteoclastogenesis through enhancing RANKL expression. IL-17, an inducer of TNF-α and IL-6 expression, is also a potent stimulator of osteoclastogenesis in RA. In animal models, it has been reported that TNF-α and IL-1β stimulate osteoclastogenesis through PGE2 . Recently, one of these research groups demonstrated that, in contrast to mouse macrophage cultures, PGE2 inhibited RANKL-induced human osteoclast formation in CD14+ cell cultures . In our cellular model of RA, we demonstrated that IL-17 enhanced osteoclastogenesis by the ST-derived inflammatory cells only when endogenous prostanoid production was inhibited by indomethacin. The result can be explained by the fact that IL-17-induced TNF-α and M-CSF production was downregulated by the simultaneous induction of endogenous PGE2. The present study also leads to a clinically important suggestion that suppression of PGE2 by the continuous use of nonsteroidal anti-inflammatory drugs (NSAIDs) such as indomethacin may augment TNF-α pathway-dependent pannus growth and osteoclastic bone resorption, resulting in the joint destruction in RA . Using a human cellular model of pannus, we have demonstrated that IL-17 induced both proinflammatory cascades, including TNF-α and IL-6, as well as negative feedback regulation by PGE2 production. The positive effect of IL-17 on pannus-like tissue growth and osteoclastic activity by the ST-derived inflammatory cells was effectively downregulated by the simultaneously induced endogenous PGE2. The negative feedback mechanisms via PGE2 could help to avoid the potential pathological damage caused by the excessive production of mediators in response to various biological stimuli such as IL-17 in RA. Whether continuous inhibition of PGE2 by the administration of NSAIDs and COX2 inhibitors could augment pannus growth and joint destruction remains to be clarified. The authors are grateful to Dr. Kuniomi Yamasaki for continuing encouragement and his financial support for our work, and we also thank Kyoko Takahashi and Kiyomi Matsuo for excellent technical assistance. Hidehiro Yamada received research fund from Ono Pharmaceuticals Co. All other authors declare that they have no competing interests. HI conducted the experimental work, performed the statistical analysis and drafted the manuscript. TNS, HM and SN helped with some experimental work and provided synovial tissues. HY and SO designed and conceived of the study, coordinated the project and drafted the manuscript. All authors read and approved the final manuscript.